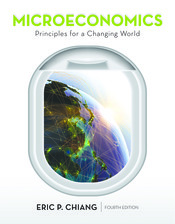 Thank you for your interest in Eric Chiang's Microeconomics: Principles for a Changing World! We’re excited to get your feedback on this text! Click to open Sample Chapter 3, Supply and Demand. Click to open our Review Survey and provide your feedback. *This promotion is in no way sponsored, endorsed, administered by, or associated with Amazon.